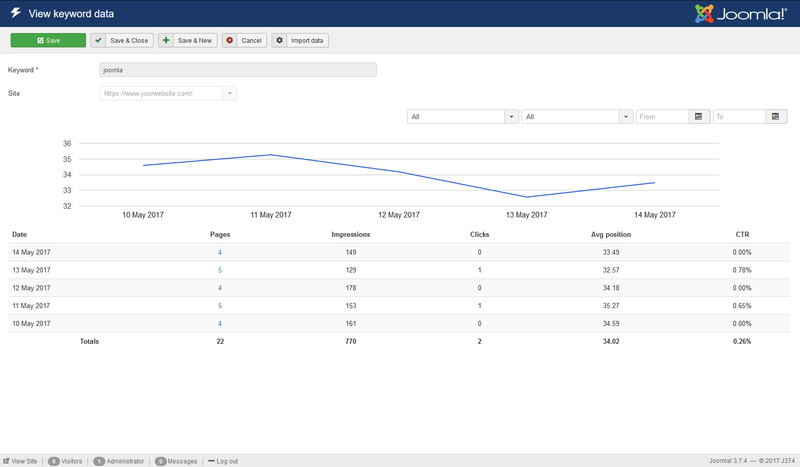 This feature is available in the "Google Keywords" section of the component, and will allow you to import statistical information about your website's keywords directly from your Google Search Console account. Enable the "Google Search Console API" by clicking on the "Enable" button at the top. Choose the "Credentials" tab across the top. Next click on the "Create Credentials" button and select "Service Account Key" option. From the "Service account" dropdown select "New services account"
You will be redirected to the "Credentials" page where you will have to click "Service accounts" on the left menu and copy the "Service Account ID" value. Navigate to backend > Components > RSSeo! > here, click on the "Options" button, then Google Keywords. 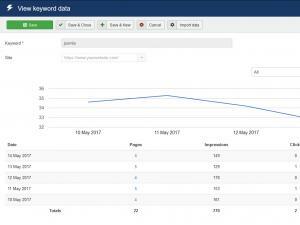 Now you can add your keywords in RSSEO! Search Console keeps data for the last 90 days. As a result, only a maximum of 90 days of data is provided. If you import the data periodically, this will be kept in the database, thus making possible to have records that exceeds the 90 days limitation. More limitation related details here. Head to Components > RSSeo! > Options > Google Keywords and enable the "Enable keywords cron"